I've been in a painting slump, some charts and mulling and such but without any real painting. I was recently lucky enough to be called out on this by a couple of dear friends, both who know that discipline leads to accomplishment. In that spirit, I've turned back to Old Master copy/study work. I'm working with Meléndez's Still Life with Oranges, Honey Pots and Boxes of Sweets. 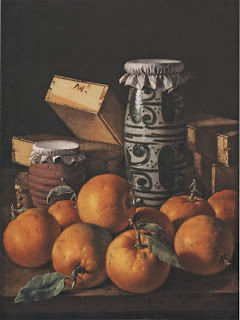 A scan from the book "Luis Meléndez Master of the Spanish Still Life"
Yesterday I began by trimming a masonite panel. The original painting is 19" tall but I scaled it down slightly to fit an 18" panel. I applied Golden's GAC 100, Gesso and finally Sandable Gesso toned with an umber aqueous dispersion. I like starting with a toned surface and the sandable gesso allows me to work up a reasonably smooth finish. 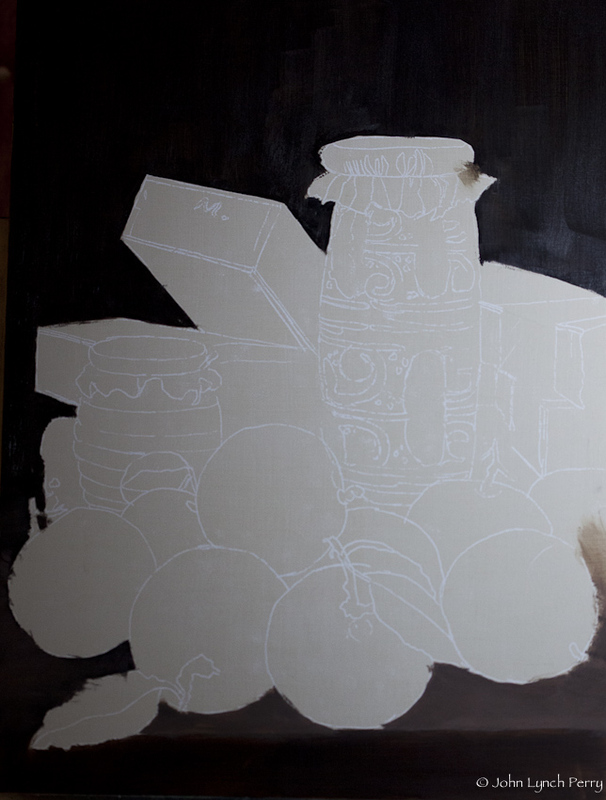 Here I've dropped in a background of ultramarine and burnt umber for a rich black and set initial values for the table. Working on a toned surface allowed me to use titanium dioxide Saral. I find it applies much easier than the graphite Saral. Thanks, Dorothy. Yup, I will take my time, poco a poco. "discipline leads to accomplishment"... love that!! Now, if only I can muster the discipline to get off this computer and go accomplish something! Been too addicted of late to the heron nest webcam hosted by Cornell. Saw the babies hatch back in early May and maybe, just maybe there might be a fledge as early as tomorrow! Don't want to miss that!